Ironically, the last question from the Visual Literacy Quiz is typically the starting place for most of my instruction. Why? Because this diagram is an excellent visual metaphor for How Art Works. In this case the light, organized by geometry, makes the invisible visible. Take a look at Diagram 1 and think about how the two sets of circles are different. Aside from their orientation the two sets are identical each composed of (4) concentric circles with 75% black and 25% blue. So where does the blue square come from. The blue square is so prominent that many will see a faint blue in the center of the four circle composition that completes the square even though that area is just as white as the area outside the circles. It turns out that we humans are great at making order out of chaos. We are constructing the blue square in our mind. We have rules for organizing the photons of light that strike our retina into information that helps us both perceive and navigate our environment. We construct what we see based on these rules. 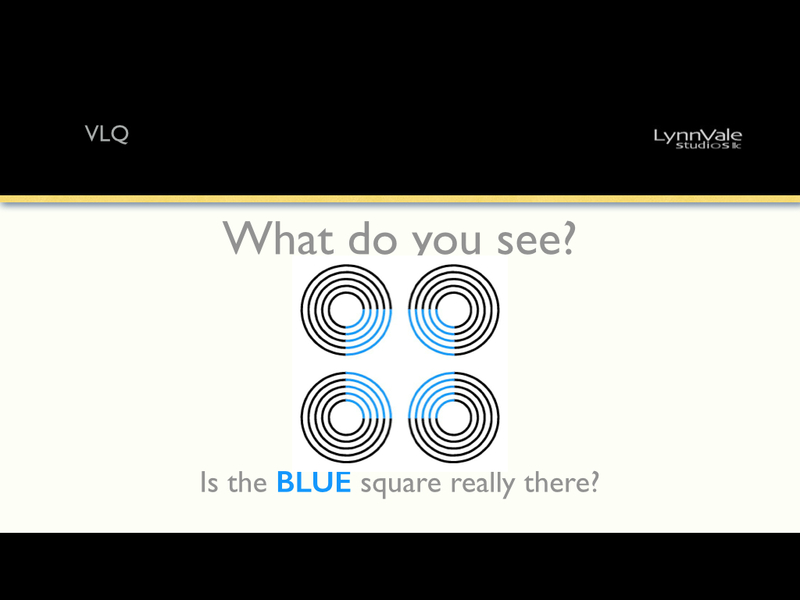 When we see the blue square we are “Constructing a visual world for which the current image is the generic view.” * While there may be many other possible interpretations we tend to choose the most stable interpretation. And so the end is the beginning. From here on we will see how we see and how we, as artists and designers, can help others see. Remember- There are no rules to art but there are rules to human perception. ← VLQ: Which Painting is by Picasso?